West Ham came from behind today to clinch a final three points at the often-difficult grounds of Turf Moor. The Hammers, with the win, finish a drama-filled season with an 11th place finish in the Barclay’s Premier League. For Sean Dyche’s side, their 16th place finish was a feeling of relief, meaning they will have consecutive years in the top flight. The hosts started the scoring early as Sam Vokes scored on a cross from Andre Grey. His 23rd minute goal brought the crowd into the game but they were subdued when Sofiane Feghouli played off of Edimilson Fernandes and Andre Ayew to find the equaliser only minutes later. While both teams had some chances, they retired at the half knotted up at 1-1. The second half was largely played in the middle third of the pitch. Adrian had a pretty light work load for match away from East London. Of Burnley’s 9 shots, only one was on target. 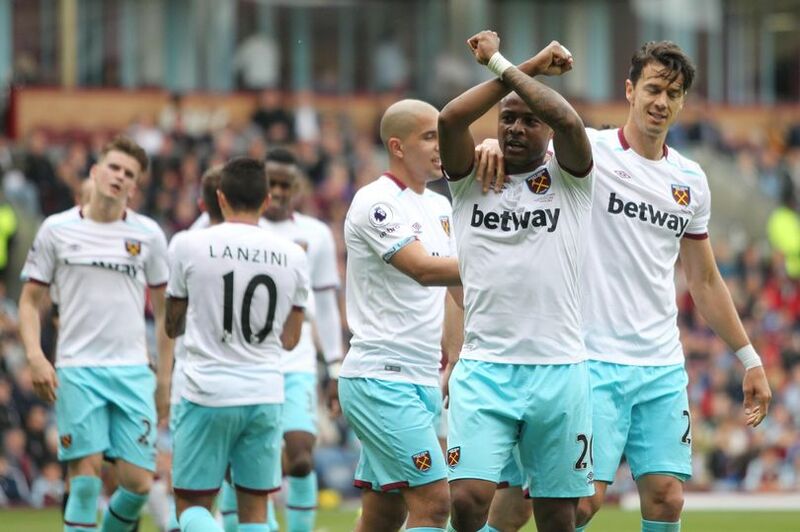 Finally in the 72nd minute West Ham had their breakthrough as Fernandes’s long range strike was batted away by Tom Heaton, hitting the crossbar and falling to Andre Ayew, who was able to head it into an open goal. The final moments of the season saw West Ham playing smart possession ball and milking away the final four minutes of added time. U23 star, Declan Rice, was called upon to replace Aaron Cresswell during the stoppage time. The 18-year old put in a good shift during his brief debut. Slaven Bilic was only able to bring six substitutes today and had eight first team regulars unavailable due to injury. Despite the adversity, West Ham was able to end the 2016-17 campaign on a high note. Last year ended with much promise and every West Ham supporter would deem this season a disappointment. However, Bilic’s side managed to only lose once in their final seven games, and can build on that momentum going into the new season. Hopefully our board learned some things during last summer’s transfer window and this year will handle their business more discreetly this summer. Too much projecting of long shot transfers that didn’t pan out, wasn’t necessarily a recipe for success heading Into the London Stadium. As the board and the coach learned from these missteps, hopefully 2017-18 will lead to some unexpected success. For all your transfer updates please follow TheWestHamWay everyday for the most reliable rumours from Ex and the team. Burnley: Heaton, Long, Lowton, Tarkowski, Ward, Brady, Westwood, Hendrick, Arfield, Vokes, Gray. West Ham: Adrian, Cresswell, Collins (c), Ogbonna, Byram, Fonte, Feghouli, Lanzini, Snodgrass, Fernandes, Ayew.